Zexion sighed as he looked around the cafeteria. He had just arrived at the school. It was difficult for him to try to talk to someone. The problem was he was usually alone. He sat alone ever since he couldn't see his sister in person. 'I wish Maxs were here,' he thought sighing out loud. Ayame just got out of the lunch line and was looking for a somewhat empty table to sit at. Then she found one and started to walk over. She placed her things down and asked smiling. "Can I sit here?" Zexion looked up when he heard someone talk. He just nodded, for he wasn't sure what he should say. He pulled out a book and started to read. Baxcel walked into the lunch room and sat down at a almost empty people. There were only two people there. "Hey, is it all right if I sit here?" he said. He looked at the boy. 'He looks awfully familiar,' thought Baxcel. Ayame smiled and said to Zexion "Thanks." Right when she was about to take a bite out of her sandwich she heard someone heard someone ask if they could sit with them. She silently nodded and went back to eating. "Thank you for letting me sit here," said Baxcel. "I'm Baxcel Senetaylor. Member of Utauloid. What about you two?" Zexion just ignored Baxcel. 'I don't actually need to talk to him. He doesn't seem like a good person.' Zexion went back to reading his book. Baxcel frowned. "Why aren't you guys talking to me?!" he asked feeling hurt, "I didn't do anything to hurt you!" Zexion sighed as he looked up from his book. He stared at Baxcel for a moment. "You don't need to know who I am. You don't seem to be trustworthy," he said a bit irritated. "Please leave me alone." Baxcel growled angrily. He grabbed Zexion by his shirt and lifted him out of his chair. "Who are you calling untrustworthy?" he said angrily, "what makes you think I'm untrustworthy?" Zexion sighed. 'This guy is annoying,' he thought. He stared at Baxcel carefully. "Do you not have a sense of personal space?" said Zexion. "What did you just say, shorty?" growled Baxcel angrily, "NO ONE SAYS ANYTHING RUBE TO ME!" Baxcel glared at Zexion. He hated that boy now. Xden looked up from his lunch. "Who's yelling?" he asked out loud. He looked up to see Baxcel holding another boy by his shirt. "Baxcel leave him alone! 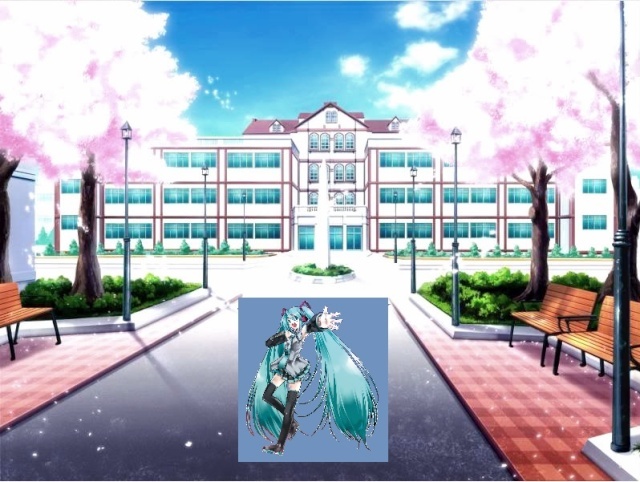 You don't want to go to Principal Miku's again do you?" Xden said as he walked over. "Oh, hi Xden. This guy is an idiot! He doesn't know how to respect other people!" cried Baxcel frustrated. He released his hold on Zexion's shirt. "I'm leaving." With that, Baxcel walked away. "Baxcel, you don't know how to respect people!" Xden yelled after Baxcel left. He turned to Zexion. "I'm Xden, a Vocaloid understudy. What about you?" 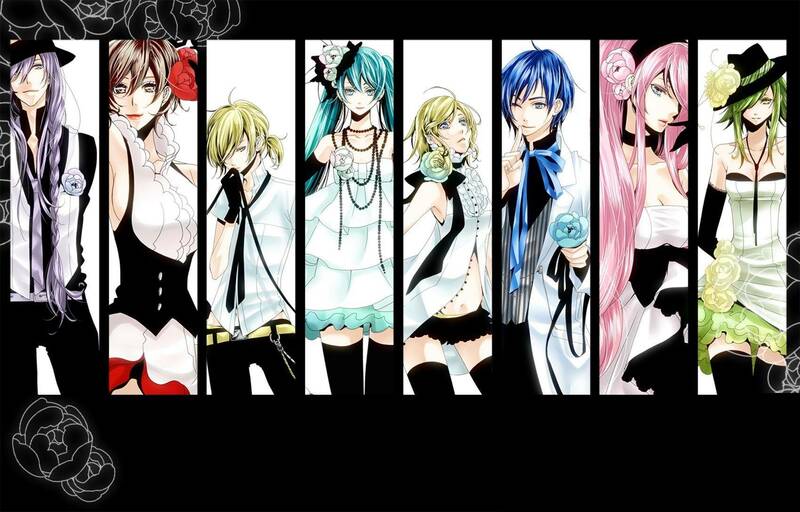 "I'm Zexion, a member of Vocaloid. It's nice to meet you. Do you know my sister, Maxs by any chance?" replied Zexion politely. He stared at the boy for a few seconds. "I'm new at this school and I'm trying to find some friends." Baxcel turned around growling. He walked back towards the table. "So you introduce yourself to him, but not me?! How could you? What are you a freak!" yelled Baxcel angrily. Ayame waited for all the drama to end before introducing herself. "I'm Ayame, a member of Fanloid." Then she saw Baxcel walking back yelling at Zexion. Well someone's arrogant. Ayame thought to herself. "Nice to meet you!" said Xden happily. "you have a nice name!" he said to Ayame. "It's very pretty!" "Nice to meet you, Ayame. I sorry I didn't formally introduce myself before Baxcel came," said Zexion. He looked over at Ayame while trying to ignore Baxcel's yelling. Ayame blushed at Xden's comment towards her name. "T-Thanks." She stuttered. "Don't worry about it Zexion. I'm sorry for doing the same." She said smiling sheepishly. Baxcel's cheeks turned red. "I'm still here you know!" he yelled. He hated being ignored. "You do realize that if you yell too much like you'll get in trouble." Ayame said turning to Baxcel. "Baxcel, you need to cool down," said Zexion shaking his head. He sighed out loud. "Calm down? You expect me to calm down?" growled Baxcel. He wasn't going to calm down. "I DON'T CARE IF YOU ARE NEW HERE, I WOULD RATHER PUNCH YOU IN THE FACE!"